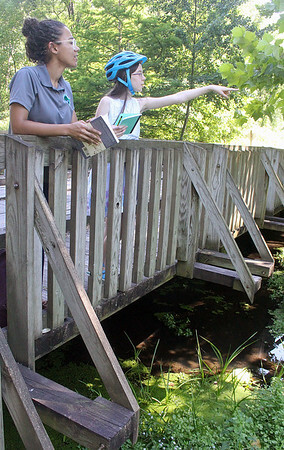 Theresa Fussner, 12, of Goshen, points out something of interest at a wetlands at Ox Bow County Park Monday while park staffer Phelicia Jozwiak, listens. Fussner and other local youth toured the park on their bicycles and made stops to study nature. The program was called Epic Explorers.